A UNIQUE ADDITION to your landscape from Freedom Forge. 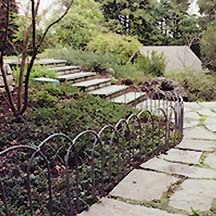 This garden border fencing system consists of a series of interlocking "wickets," hand-forged from 1/2" wrought iron, that interconnect to form a strong and graceful border fence. Sticky Wickets adapt easily to the shape of almost any garden. Wickets can be installed quickly and easily by almost anyone -- no special tools are needed. They are also sturdy enough to encourage pets and children to stay out of your prize petunias! CONTACT FREEDOM FORGE: Phone/fax: 831-427-3422 / email: kirk@freedom-forge.com.